Created in Illinois, Comstock-Castle is a company with story and tradition. Their original mission was to provide their clients with the best stoves and grills in the entire country. The company opened its doors after following the thousands of families that moved west. These families did not carry their stoves and needed a trustful provider. Many years later, Comstock-Castle continue with their goal and are now one of the prime stove manufacturers. They used to work mainly with kitchens for homes but as the market changed, the company evolved too. Nowadays, their main market is the commercial industry. Restaurants, hotels and any kind of business that requires a stove will contact Comstock-Castle first. Despite how big the company gets, Comstock-Castle remains a family business. The current owners follow the vision Comstock and Castle had back in 1846. One of those rules is the width of the ovens. A Comstock Castle stove can be 19 1/2 ", 26 1/2 " or 31 1/2 ". Each size offer different possibilities. For example, a 31 ½” allows the air to circulate and the borders will not get scorching as it happens with smaller models. The extra air allows the cook to use the entire stove without issues, this is an advantage that a Comstock Castle stove has over other brands. The Comstock Castle stove is only fully modular in the market. A modular stove not only saves space but also money. A modular piece includes several different parts with different uses. 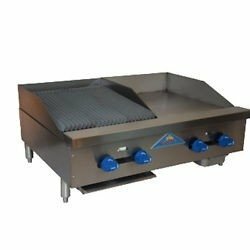 Griddles, broilers, cheesemelters and burners are some of the option available. If the purpose is not to save space but to have a multifunctional unit, these modular units can be 60”. The average Comstock Castle stove is designed for commercial use. Good news is, these incredible stoves can be used at homes. The owner will have to go through an up to code installation process, after that they can enjoy their Comstock Castle stove. Big families could benefit from these type of equipment. It is possible to acquire a Comstock Castle stove online. The price change from model to model and site to site. Chef’s Deal Restaurant Equipment offer the best prices in the market for all its clients. Choose the model, the condition and how you want to pay. Perhaps a used model is more in your budget. The team on Chef’s Deal works hard to guarantee that even the used items are in optimal condition. New equipment include a warranty and competitive shipping rates. Chef’s Deal Restaurant Equipment believes on creating a lasting relationship with their clients. A customer is more than just a number for this company, the customers are partners. To keep that good relationship going, Chef’s Deal Restaurant Equipment and Quick Park partnered up to create financial plans for the clients. With minimum requirements, every client will have access to the different plans. Get your Comstock Castle stove with the best, Chef’s Deal Restaurant Equipment.